LAS VEGAS, Nevada, February 8, 2013 (ENS) – The biodiesel industry “is helping create “a new dynamic in America,” U.S. Agriculture Secretary Tom Vilsack told a packed audience at the 20th anniversary National Biodiesel Board Conference & Expo Thursday in Las Vegas. “The biodiesel industry is making us a more secure country, and the most exciting piece is that it’s not just limited to fuel and energy,” Vilsack said in his keynote address that closed the four-day event at the Mirage Hotel Conference Center. Biodiesel is an advanced biofuel made from sustainable resources such as soybean oil, recycled cooking oil and other fats and oils. It has outgrown its backyard roots to become the first and only U.S. EPA-designated Advanced Biofuel produced on a commercial scale across the country. “You have the power to make us more energy secure, and still create enough food and fiber for the world. 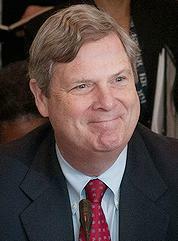 That’s an amazing opportunity worth fighting for,” Vilsack told the biodiesel conference. 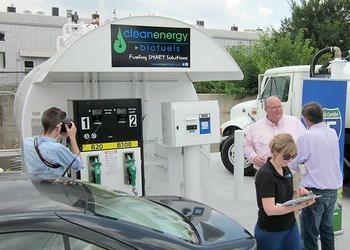 Biodiesel has taken the lead as the first commercially available advanced biofuel on the market. With the U.S. biodiesel industry producing more than a billion gallons of fuel in each of the past two years, biodiesel is seeking a bigger share of the diesel market. The industry is already boosting income for farming families across the country. The agriculture secretary said U.S. dependence on foreign oil is less than 50 percent and dropping, “in large part because of the advancements this industry has made. In turn, the National Biodiesel Board praised Secretary Vilsack as one of the strongest advocates for renewable fuels in the nation, and presented him with its National Energy Leadership Award. “I’ve witnessed the beginning of a rural renaissance that is remarkable, and you, sir, have presided over it,” said Joe Jobe, CEO of the National Biodiesel Board. Jobe is convinced the only way to protect fuel consumers and the US economy is diversify the U.S. transportation fuel supply – ethanol, propane, natural gas, and electric vehicles – and most important to him, of course, biodiesel.